. . . so goes the United States? Well, maybe the dependents of our welfare state won’t riot. 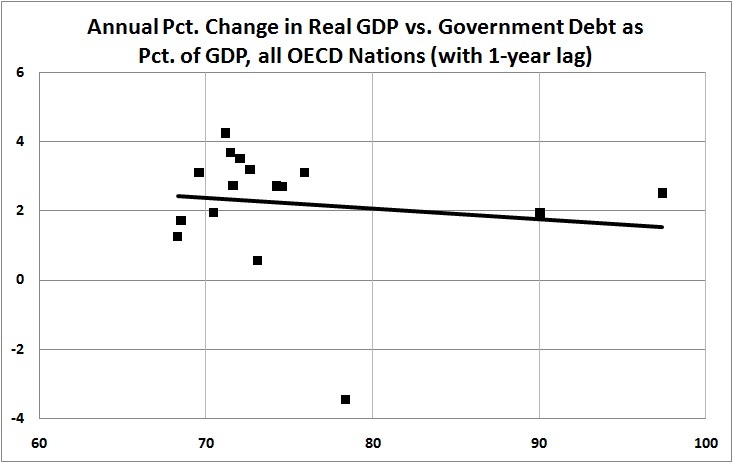 But, riots aside, the U.S. has much in common with Greece: a huge and rising burden of government (accompanied by a huge and rising burden of government debt), leading to economic stagnation. Derived from tables 1 and 32, available at OECD Economic Outlook No. 86 Annex Tables — Table of Contents. 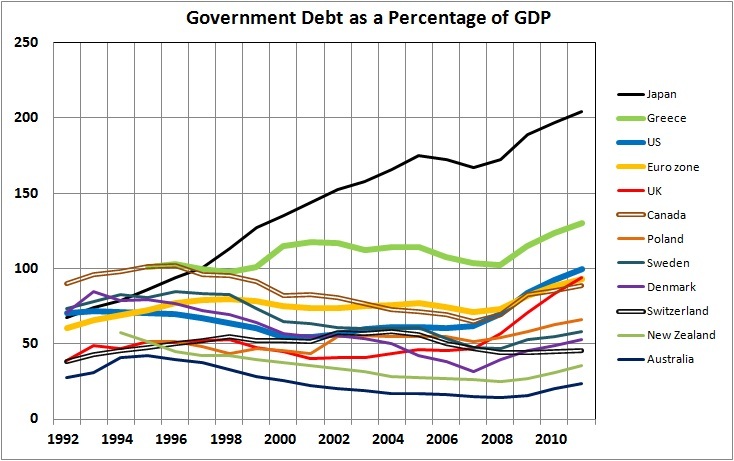 The debt-burden statistics represent gross government debt for 1995-2010. The changes in GDP are for 1996-2011. Derived from OECD annex table 32. I use gross debt because net debt understates the debt burden. For example, it treats the federal government’s IOUs to the Social Security Trust Fund as if they were legitimate assets, which they are not. All Euro zone countries are represented by the wide, gold line. Greece is a Euro zone country, but I have plotted its debt burden separately to highlight its plight. Japan, the most burdened OECD country, is infamous for its economic stagnation. And there’s the U.S. (wide, blue line) moving ahead of the Euro zone, and not far behind Greece. What’s worse is that the outlook for the U.S. beyond 2011 is deeper debt. What we’re seeing in Greece is the death spiral of the welfare state. This isn’t Greece’s problem alone, and that’s why its crisis has rattled global stock markets and threatens economic recovery. Virtually every advanced nation, including the United States, faces the same prospect. Aging populations have been promised huge health and retirement benefits, which countries haven’t fully covered with taxes. The reckoning has arrived in Greece, but it awaits most wealthy societies. . . .
Greece illustrates the bind. To gain loans from other European countries and the International Monetary Fund, it embraced budget austerity. Average pension benefits will be cut 11 percent; wages for government workers will be cut 14 percent; the basic rate for the value added tax will rise from 21 percent to 23 percent. These measures will plunge Greece into a deep recession. In 2009, unemployment was about 9 percent; some economists expect it to peak near 19 percent. If only a few countries faced these problems, the solution would be easy. Unlucky countries would trim budgets and resume growth by exporting to healthier nations. But developed countries represent about half the world economy; most have overcommitted welfare states. They might defuse the dangers by gradually trimming future benefits in a way that reassured financial markets. In practice, they haven’t done that; indeed, President Obama’s health program expands benefits. What happens if all these countries are thrust into Greece’s situation? One answer — another worldwide economic collapse — explains why dawdling is so risky.